Hutchinsons are proud of the excellent specialist service they provide to fruit growers, but they are not resting on their laurels and continue to think ahead and outside the normal realms of agronomic advice by initiating and investing in a ground-breaking 10-year project for top fruit, called HELIOS (Hutchinsons Enhanced Light Interception Orchard System). 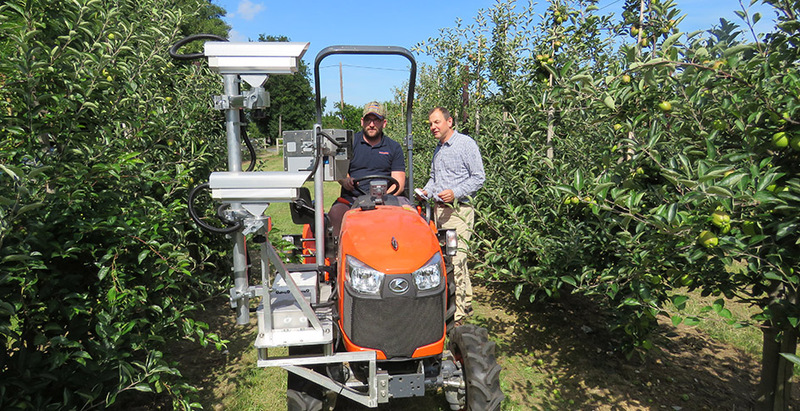 The project is based on the simple premise that the ultimate yield of apples is relative to how much light the tree can get, explains Rob Saunders, one of their specialist agronomists. “We think it may be feasible to achieve consistently higher crops of quality fruit, if the tree is able to capture more sunlight. By redesigning the canopy and tree architecture, it should be possible to intercept more light, which should mean higher yields. The Helios project has been set up to see if this theory can be proven. We are planting trees from different rootstocks, thinking of different support systems and redesigning the way the trees grow, so that less light is wasted by getting to the orchard floor. We have thought about more of a canopy in a simple horizontal plane with little depth – flatter canopies more open to the light,” says Rob. The idea of Helios is to see how yields can be increased and how an orchard can be established more cost-effectively. The project is scheduled to run for ten years and growers will be invited to one of the sites to see for themselves how the project is progressing during that time.